Thread: What NOT to do when it's really, really hot! Ka-Boom! What NOT to do when it's really, really hot! Did a two day rafting trip this weekend on the Thompson / Fraser rivers in BC. It's a trip that a bunch of us do as a stag when one of our buddies decides to get married. It just so happened that this past weekend temperatures hit the low 40's in the Lytton area (Thompson river) and in some parts of the Fraser river canyon. So, because we're going away for a couple of days and we know it's going to be hot, Hot, HOT we buy a lot of liquids: tons of water, tons of gatorade, and a bunch of Coke and Diet Coke. Saturday morning we leave and we come back Sunday evening. The water and the gatorade make it into our coolers that we're taking with us, but somehow the bottles of diet Coke and 12 pack of Coke end up staying in my car - with a BLACK leather interior. This is problem #1. Problem #2 is that my car is parked in the middle of a parking lot without any shade around. Problem #3 is that some of the impending dissaster could have been avoided had I left my sun roof and windows open - of course, they were sealed shut! Problem #4: the heat: it hit 43 degrees Celsius which is about 110 F OUTSIDE the car. I can only guess what it would have been inside the car - probably well into the 50s (120's F). Problem #5: I AM DUMB for not taking this stuff out of the car! 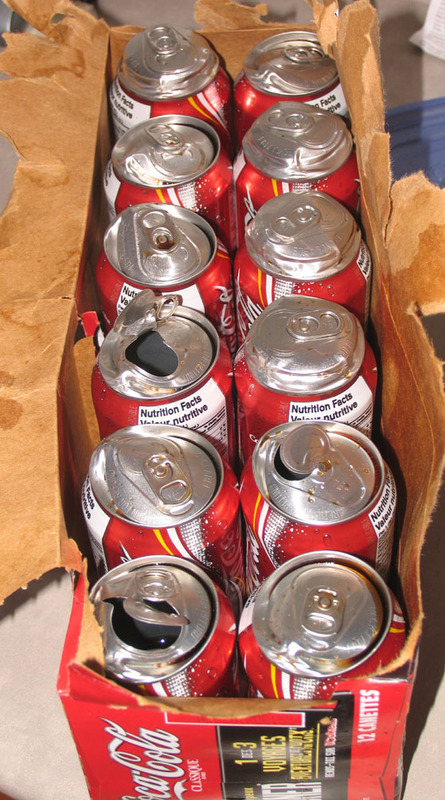 The 12 pack of Coke cans: 9 ruptured. Some where less than half full. The Coke box gets points for not leaking and holding in SOME of the coke. However, probably another 500ml of Coke managed to escape all over the back seat and onto the rear floor. 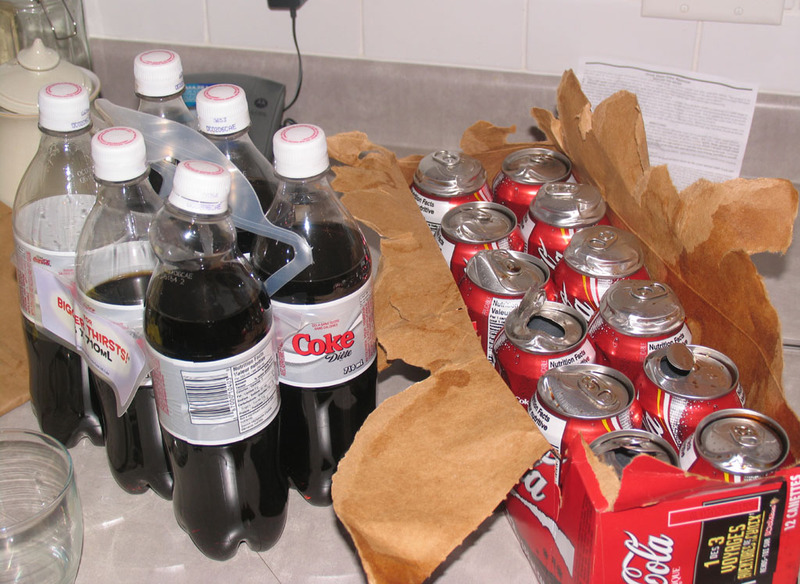 3 cans survived - their tops popped uniformily and that allowed them to maintain their structural integrity. Scissors in the last picture were used to puncture the sides of the cans that had leaked but whose pull tops were still sealed. Moral of the story - don't leave sticky beverages in your car if it's really freakin hot outside!!!! Last edited by knollybikes.com; 07-24-2006 at 11:12 PM. Instead of PMs, please contact me here. I wonder if Pepsi would do this! Täglich drei Millionen Leser der Kronenzeitung abzulehnen, ist ein Zeichen tiefster moralischer Verkommenheit. I can only guess what it would have been inside the car - probably well into the 50s (120's F). 80 Celcius easily in a black car. Don't leave carbon fibre bikeparts in there as well, i've heard storys of carbon frames bending and turning brown inside parked cars. The_Lecht_Rocks: whafe - cheeers - may i offer an official apology for the wagon wheeler "dis-belief"
Noel, I bet if you designed those cans, there wouldn't be any structural failures. Don't trust the Colonel (Sanders), because he has beady eyes and puts something in his chicken that makes you wake up in the middle of the night craving it. Heh ... having seen the inside of your car, I'm surprised you noticed! I used to be with it. Then, they changed what "it" is, and now what I'm with is no longer "it". And whatever "it" is, is strange and confusing. Ya - the alcohol was sacrificed Friday evening We had the "groom" annihilated quite nicely. Saturday morning we were taking the bus from the base camp to the "put in" about 100 km away - the 7 of us and fifteen 12-15 year olds who were part of Moondance adventures (kind of like Outward Bound I think). We had to get the bus driver to pull over so the groom could "clense the gullet". All the kids were going "wow - that guy gets really car sick!". Once they realized how hard we were laughing at our buddy they figured out what was going on! Possibly 80 degrees? Wow - that is crazy hot! Shameless plug (that has nothing to do with us): if any of you are into rafting, definitely check out Fraser River Expeditions. There are about 4 rafting companies in this area and these guys are the money. Way more core and way less commercial than the over companies and they do everything from single day trips up to 3 or 4 week trips. The guides are excellent and super knowledgeable. Our group has done something like 5 trips with them over the past few years and every trip has been absolutely excellent. The Thopson River is full of great rapids and several that you can swim. The Fraser is a huge river (largest undammed river in North America) and has several grade 5 and 6 rapids. Can't swim them (unless you can hold your breath for about 3-5 minutes and don't mind your eardrums being blown out) but several of them can be hit repeatedly by motoring back up through the eddies. Last edited by knollybikes.com; 07-25-2006 at 10:58 AM. Either of you two heading up to Whistler this summer? Or WCH are you planning to get probed at the border again? pffft.. the coke's Canadian.. no wonder it exploded! j/k that's a bummer man, thank you for the well illustrated lesson. must of taken a while to clean it up. at that point i would have just sprayed the interior down witha garden hose. Ripped it open to check out the carnage (plus it had about 5mm of coke in the bottom of the box that needed to be strategically emptied). Would have loved to watch the 3 cans that actually exploded go off. 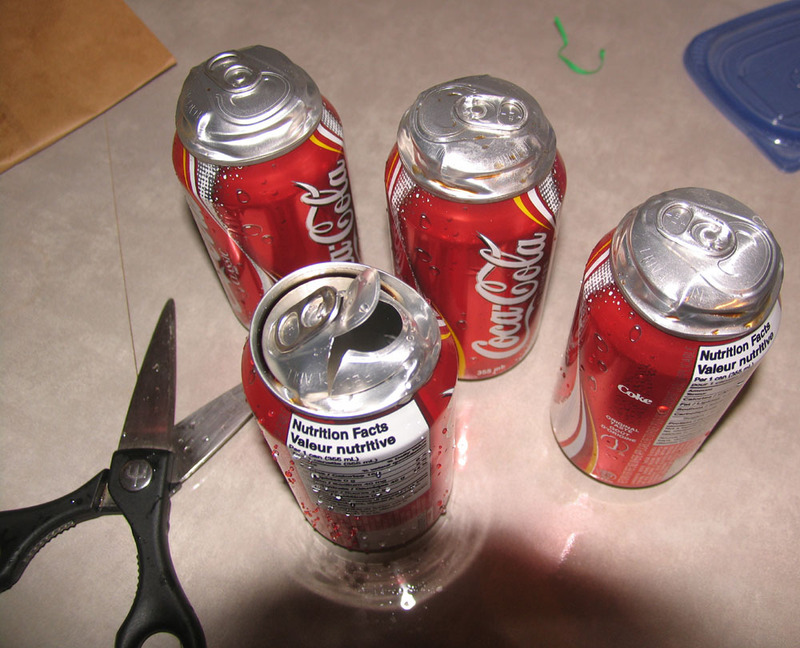 Would have loved to watch the 3 cans that actually exploded go off. I suggest you shake a can for 30 minutes and then place it in a fire. Works wonders. For a better explosion, make sure its in coals. But don't stand near for long, it usually takes about 5 seconds before it goes. In a good one you will probably move the fire a few feet, and I recommend watching out for 'shrapnel' aka glowing coals. They are painful. I have opinions of my own -- strong opinions --but I don't always agree with them. did the short bus forget to pick you up today??? Every now and then you hear of some moron leaving their pet, or much worse a child in a car like that. Fortunately not often but those idiots do exist.